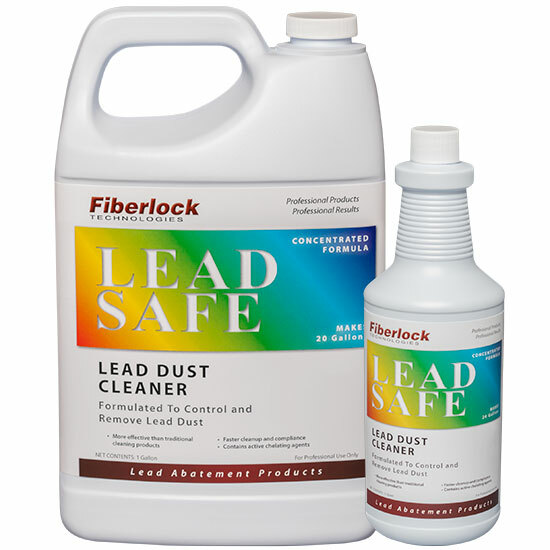 Following any lead abatement projects, construction, renovation that disturbs lead and creates dust, use LeadSafe Lead Dust Cleaner to assist in the cleanup. This product is formulated to remove more lead dust than ordinary cleaning products, by utilizing chelating agents similar to those given to individuals with lead poisoning. Dilute 6-7 oz. per gallon of water. (One 32 oz. bottle will make 5 gallons) (One gallon will make 20 gallons). One gallon of diluted product will clean approximately 500 square feet of hard, non-porous surfaces. Clean and remove all belongings from the area to be cleaned. Prior to application use a HEPA filtered vacuum on all surfaces. Starting at the end farthest from the exit, vacuum the room towards the exit beginning at the top of each room and working down. When applying the cleaning solution start in a far corner working towards the exit of the room to avoid re-contamination of the cleaned areas. Always wear appropriate personal protective equipment (PPE) including gloves and eye protection during any lead abatement or cleanup activity. See warnings below for additional precautions. Three Bucket Cleaning System: By following this system you will minimize the risks of reintroducing lead back into the cleaned environment. Bucket 1 – Contains uncontaminated LeadSafe cleaner solution. Bucket 2 – This bucket is empty and will be used to hold all dirty water. Bucket 3 – Contains clean water for rinsing. Using a mop, rag or sponge dip into bucket #1 and begin cleaning surfaces until clean. Ring out mop, rag or sponge into bucket #2 and return to bucket #1 for more cleaning solution. Use clean water from bucket #3 to rinse surfaces. Replace cleaning solution and rinse water when dirty. For tough to clean surfaces including porous surfaces use warm water when mixing the solution and allow the product to sit for 10 minutes prior to cleaning.